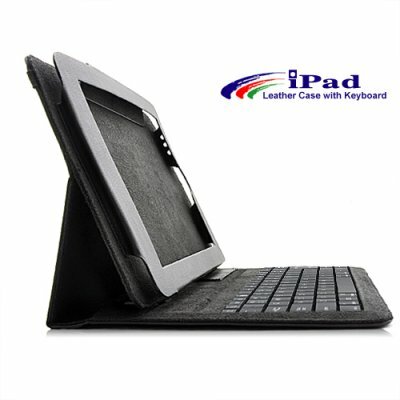 Successfully Added Leather Case Holder with Keyboard for iPad / iPad 2 / iPad 3 (Black) to your Shopping Cart. This iPad / iPad 2 / iPad 3 leather case comes with a built-in black colored keyboard that seamlessly connects with the iPad for a quicker and more comfortable typing. This iPad / iPad 2 / iPad 3 case holder can easily convert into a laptop style position for a more comfortable typing, as well as for tablet use, by folding the iPad leather case which then hides the keyboard out of sight. This iPad leather case simply opens like a book while providing full protection for the iPad screen. It also allows access to all the controls and ports at all times, meaning you have full functionality whilst your iPad is still inside the case. This stunning iPad / iPad 2 / iPad 3 case is made with incredible attention to detail, ensuring that it is of the very highest quality. This amazing new Apple accessory is perfect for reselling on your ebay listing page or drop ship website. Click "Add to Cart" now, and Chinavasion will express ship you a sample straight away. Does this iPad case also come with any pockets to memory cards? Yes, this iPad leather holder with keyboard comes with 2 pockets conveniently located right above the keyboard.